Star Wars: The Force Awakens has been blowing up at the box-office, with IMAX theaters experiencing a record year of IMAX revenue. Recently the film became the highest grossing film for IMAX theaters to date. And that's not to mention the massive success that The Force Awakens is having outside of IMAX as well. IMAX is having fun with their marketing for Star Wars: The Force Awakens. Select AMC IMAX theaters have been issuing beautiful posters to anyone who attends an IMAX screening of the film from December 20th to January 10th, with four posters all together. We've seen two of these posters for the past two Sundays, but now we have a look at the third poster. AMC Theatres has officially unveiled this stunning poster for their third Sunday giveaway (January 3rd). Check out the full poster below. 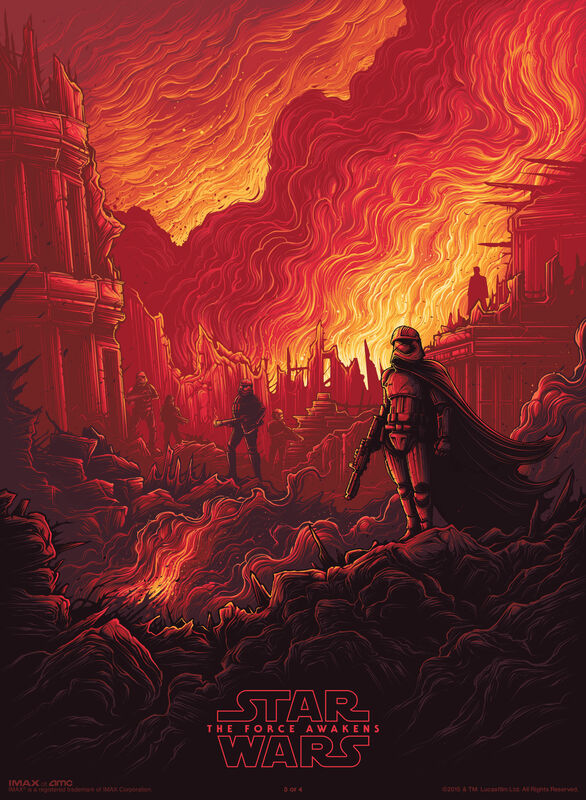 The poster features Captain Phasma, a character played by Gwendoline Christie (Game of Thrones) in the film. The scene appears to come from the destruction of Maz Kanata's castle in The Force Awakens, though it could just depict the general carnage and destruction that likely follows in the wake of Captain Phasma. Captain Phasma, though a visually impressive and foreboding character, is often one subject of ridicule for the film, given her unexpectedly small role. She also has a moment in the film where she is easily overcome. As a result, Phasma has been compared to Boba Fett from the original Star Wars trilogy, who also looked menacing but met an anticlimactic end. Thankfully, Captain Phasma is confirmed to appear in Episode VIII, so we haven't seen the last of her. And chances are high that she will return with a vengeance. This marks the third of four posters that will be released through AMC Theatres. AMC is challenging customers to "make sure to collect them all." But who would go to see a film that many times in theaters? Well, a lot of people actually. The Force Awakens recently became the fastest film to reach $1 billion dollars globally. People are lining up to see the latest Star Wars movie multiple times, including this author. And with all of this hype and box-office success, fans are already looking away to the future with the upcoming Star Wars spinoff film, Rogue One, coming next December. Plus there's also the sequel to The Force Awakens coming in May of 2017, only 17 months after the release of The Force Awakens. For Star Wars fans, there's no better time to be alive.